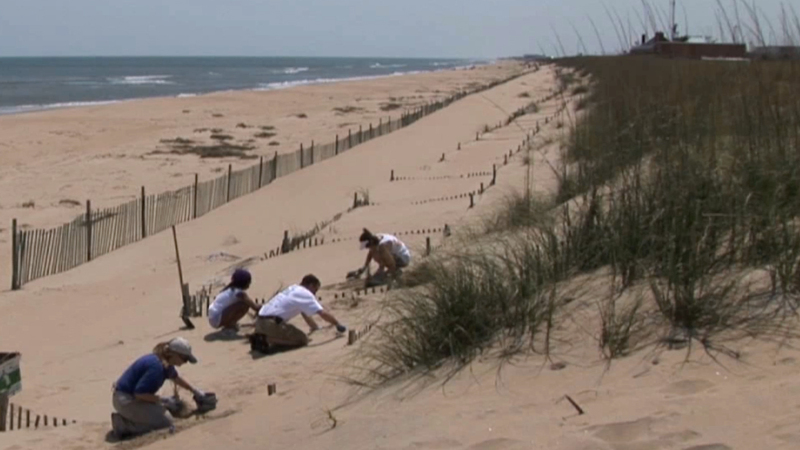 Laura Bankey: “Today we are at Dam Neck Annex, part of Oceana Naval Air Station in Virginia Beach, Virginia, restoring sand dune habitat along the Atlantic coast. Narrator: Sand dune habitat is the first line of defense against severe weather patterns moving in from offshore. The dunes can help protect houses and other buildings behind them from strong wind or wave events. The roots of the grasses that these volunteers are planting here today fan out beneath the dunes, helping to keep the sand from blowing away or washing out with the current. Michael: “When they are actually are out here doing the planting themselves, it gives them a vested interest in the area. They not only get to learn about where they’re living, see what else is living out here, but they also, because they are doing the work themselves they want to maintain it. If they do work, they don’t want to see it go away. Narrator: This particular beach was chose because it is prime habitat for a variety of wildlife and one of the few undeveloped beaches on the East Coast. It is important to work to protect environments like these, not only for the animals that live there but for ourselves as well.